Last month I made my recipe for the Improv Challenge at the last minute and just never had a chance to get it blogged before the posting day. I had grand intentions of making my recipe for this month right away, so even if I couldn’t get the recipe typed up right away, I’d have extra time. That never works out. I made this last Sunday and didn’t even get in the fridge to chill until 2 hours before the sun was going down, giving me a very limited window to actually get a decent photograph. 1. Preheat the oven to 350. Spray a 9×13 baking dish with non-stick cooking spray. 2. Unroll the cookie dough into the baking dish and press into an even layer. 3. Bake for 14-16 minutes or until golden. 4. Sprinkle the marshmallows evenly on top and bake for another 3 minutes or until the marshmallows have fluffed up. Meanwhile, combine the peanut butter chips with the corn syrup and butter and microwave in 30 second intervals until smooth. 5. Put the popcorn and peanuts in a large bowl and once the peanut butter chips are fully melted, pour over the popcorn and stir with a spatula quickly to distribute. 6. 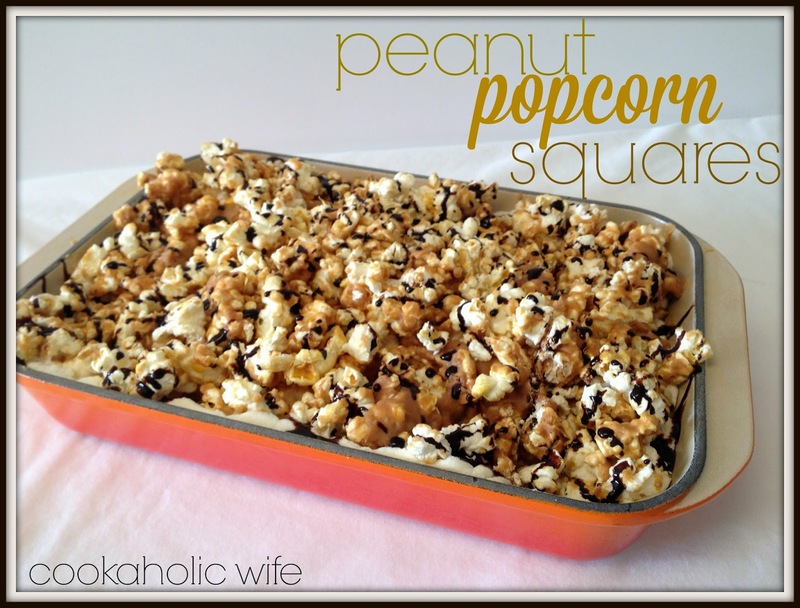 Spread the peanut butter popcorn mixture on top of the marshmallows and press down with a spatula. 7. Melt the chocolate chips in the microwave until smooth. Drizzle over the popcorn. Allow to cool for 30 minutes before refrigerating until chilled, at least 1 hour. 8. Cut into 24 squares. Honestly, this was a lot of cookie base for me and I could have easily went with using half of the cookies to press into a thinner layer. But this was still a really tasty treat. I’m usually a popcorn purist and was impressed that I liked this. 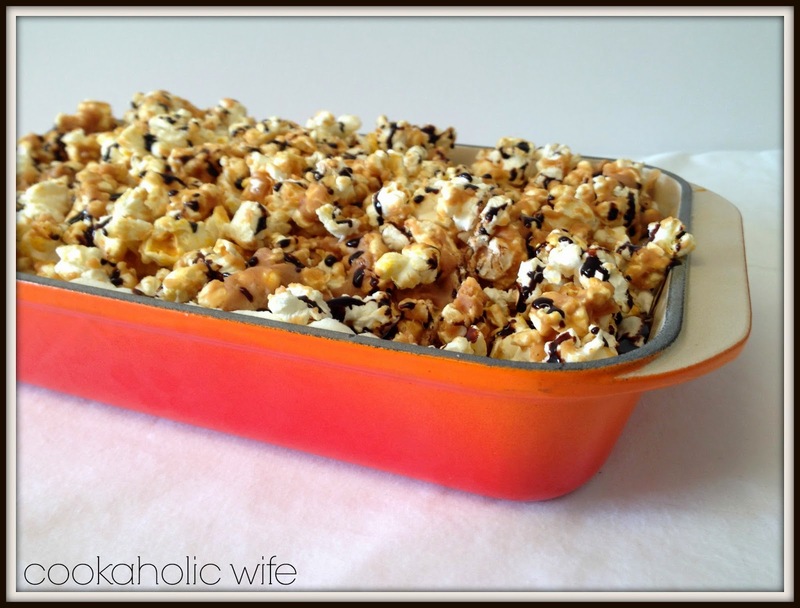 I like the idea of a cookie base to carry the sweetened popcorn into my mouth. These sound delicious!